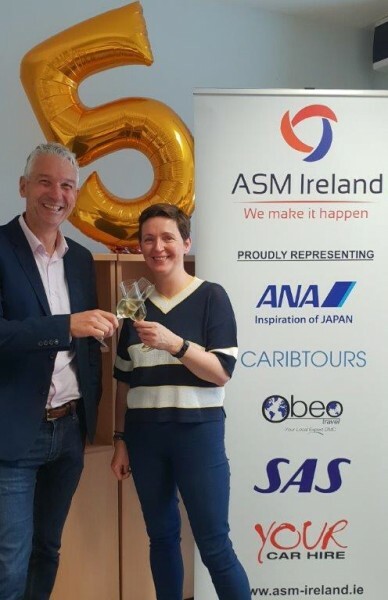 Alan and Joanne (ASM Ireland) launch Caribtours 2019 brochure in Dublin. Caribtours, the leading luxury tour operator represented in Ireland by Alan Sparlings ASM-Ireland hosted 30 agents for a dinner at The Ivy to launch their 2019 brochure. Paul Cleary (Managing Director Caribtours) thanked the agents for their unbelievable support. “Alan has been representing us in Ireland for just over four months and already we are thrilled with the support agents are giving us.” Paul went on to say that the Caribtours commitment to the Irish market is 100% and we can expect to see a lot more of him and his team over the coming years. ‘We are the known experts on the Caribbean, our staff have walked every beach, slept in every hotel and dined in every restaurant that feature in our brochure. We also feature exceptional luxury holidays to Europe, Mauritius, the Maldives, Mexico, Cuba, USA as well as the Emirates. There were plenty of fantastic agent prizes on the night and Josie Carrigy (Arrow Tours) was the winner of a wonder 7 night holiday at St Lucia, staying at Body Holiday & The Rendezvous.